Those Samus and Link costumes in Dynasty Warriors Vs. certainly look nice in stills, but how about in motion? Your wish is Tecmo Koei's command. The trailer below shows small snippets of Dynasty Warriors' characters clad in the garb of Nintendo's famous blond/e hero/ine, plus footage of Dead or Alive: Dimensions' Ryu Hayabusa and Ayane. Oh, and there's some tigers in there too. Set good times to maximum. Your own Mii? Now THAT is a deal breaker for me. wait. this is for 3DS ? took me a while to understand it clearly, thoguht it was for WiiU. This looks pretty good. But your own mii? That might be a little weird but looks kind of fun. Why can't we just have an actual Dynasty Warriors game on the Wii? Damn. So is this by the Samurai Warriors Chronicles team? It is a good thing that the 3DS is getting entries that have unique spins on the franchise and I really enjoyed SW Chronicles(my first Musou game!). Will get this whenever it is released in Europe. If that was for the WiiU, then Nintendo is even more behind the 360 and PS3. It is just me, or does 0:22 sound familiar? Held off on Samurai Warriors Chronicles because I knew Koei would eventually make a better game soon anyway, so now I can't wait for this one to come out! Wow. This game is shaping up! Those visuals look even better than SW:C! And, is it just me or did I see some motion blur there? Never played any of these games but I may check this one out. 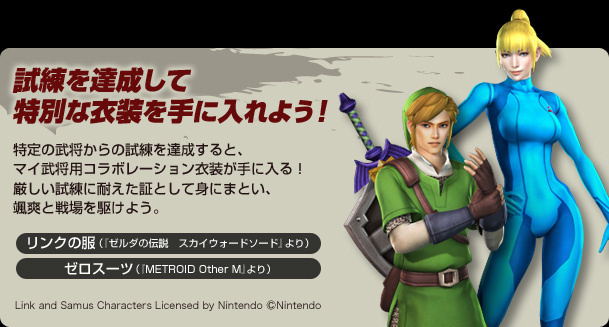 Link and Samus? You just got my attention. Loved SW:C, so this was definately on my radar. And now I know it has Link/Samus costumes, Ayane and friggin' Ryu Hyabusa as playable characters, some SW characters are playable, and even your Mii! Does anyone know when this epicness releases Stateside? I am going to get this.